Celebrate Spring! And all that it brings – sun, flowers, and the warmth of family and friends. you will be perfectly dressed to step into Spring! Knits are again interesting, practical yet innovative. Openwork crochet pieces are cool and comfy. Knit pieces offer a hodgepodge of materials and colors to create newness. The interest is in the detail – now more than ever. Skinny pants, crop leggings and jeggings will remain a fashion look – cool and easy when topped with the sharkbite hemline tunic or oversized top for spring into summer. The look is so easy, so comfy, so youthful and BEST OF ALL – it is a slimming look for all ages on the go. Lady’s Image offers an awesome selection of pants. Our ‘Not Your Daughters Jeans’ continue to be a joy to all of us who wear them – look forward to new styles in light weight blue denim, white denim, black denim and colors, in shorts, crops and pants. Great for work, play and wherever the day takes you. Of course, our favorite K L pant will be offered in a host of new colors and new fabrics. Join our customers who own this pant in every color. Trousers are NEW, reflecting the seventies silhouettes and ladylike fashions. Loose draping and a sportier style dominate the direction. The look can be dressy or casual, you choose. Become your own personal designer when it comes to occasion wear. Our seamstress is busy shortening long gowns to personal lengths for our ladies: mini, short, above the knee, below the knee, tea-length and ankle length. This is so fabulous for our customer as the fabric that is cut off can be fashioned into a shawl. Prom to Black Tie you will find an artful mix of wear ability, newness in fabric and a chic touch in design. You will be excited by the depth of choice in every size 2-24. Our final touch is the simple joy of the accessory. Add an exotic elegance to classic styles with our exclusive accessories representing cutting edge designers, many of whom are local. Handbags, scarves, shoes, and jewelry – edgy but not over the edge. Don’t forget our spanx – the ultimate underpinning accessory. If you are looking for a new handbag, our fabulous JPK handbags come in oceans of colors. So comfortable to carry and so convenient to use. One customer found she couldn’t decide on color, so she bought three JPK handbags in different colors. With vivacious brights and gelato-rich pastels you won’t be able to resist the lure of the new switches and buttons for our Lindsay Phillips switch flops and ballerina flats. Simply yummy. The shoes are nothing but comfort and style. as Best of Delaware by readers of Delaware Today Magazine. 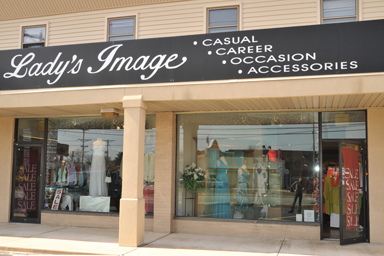 Best of Delaware for Occasion Fashions. Best of Delaware for Business Attire, and Best of Delaware for Casual Clothing. We thank Delaware Today and their readers for this awesome recognition. Swing in and get to know us. Come; experience Lady’s Image for yourself…. 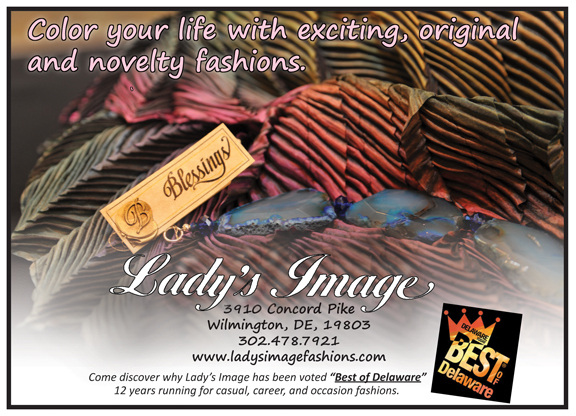 Thank you for voting us “Best of Delaware” for 14 years running: Casual clothing, Career attire and Occasion ensembles.